NEWSFLASH: Battlestar Galactica (BSG) is reopening! 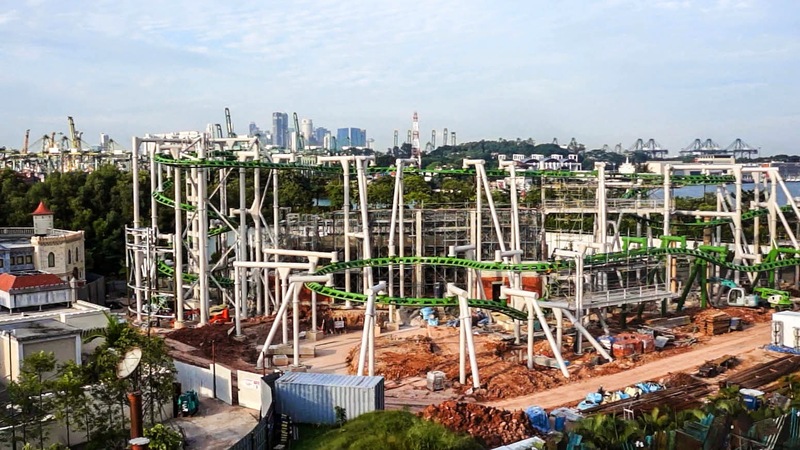 In case you missed it: BSG will reopen at the end of 2014, according to Genting Group. I’ve no idea why the news fell under the radar. 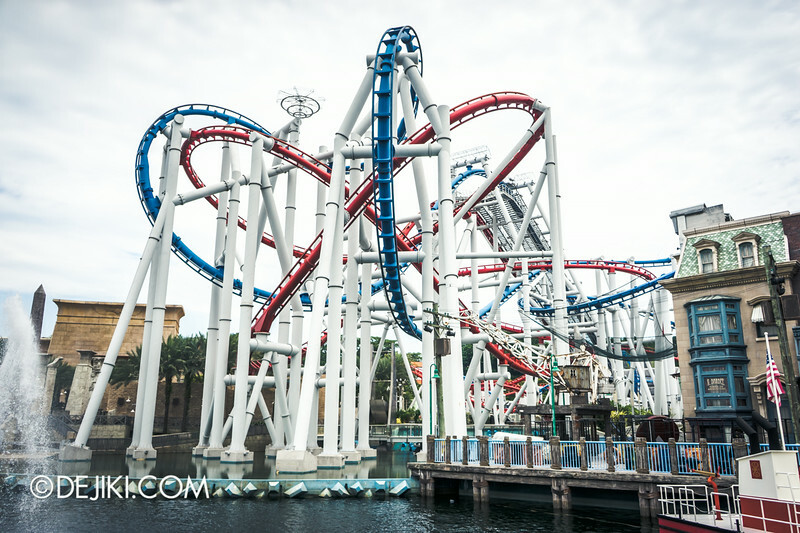 The blue track, Cylon, is well-known for its full vertical loop. 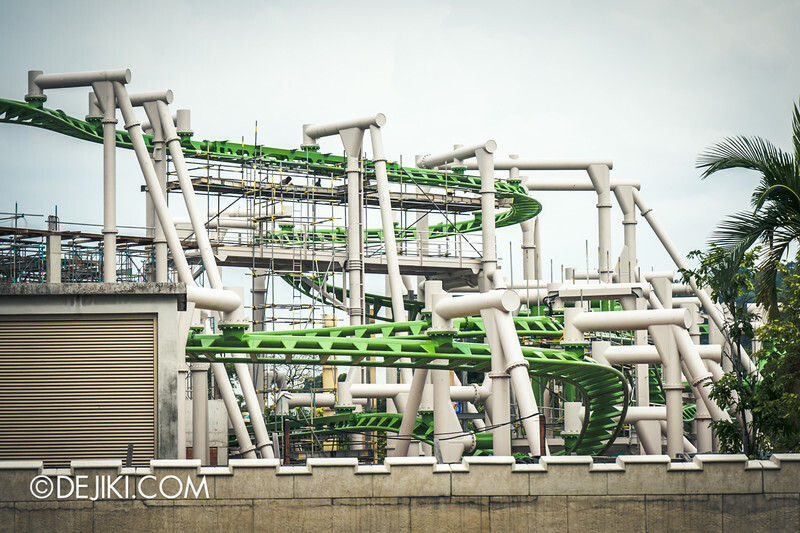 Recently, the walls (and possibly) floor of the loop section has been painted green. This could possibly enhance the effect of the loop “going through the ground”. Previously this section has a mist pit, with white walls and flashing lights. 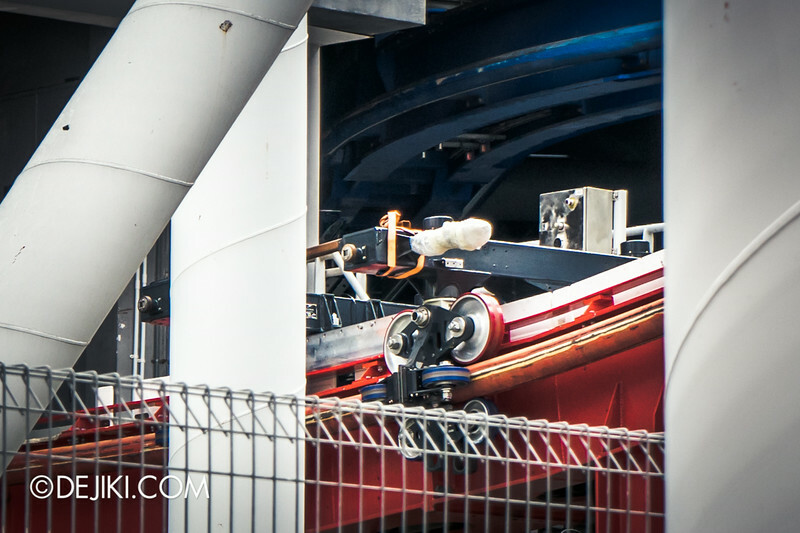 With track replacements and paint overhaul, some sections of the rollercoaster tracks look very new and clean. 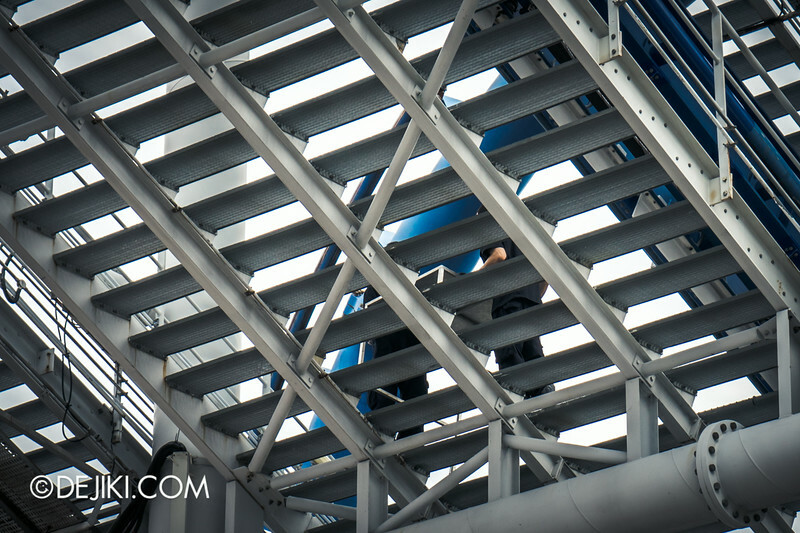 Ride technicians were spotted along the launch bridge, along with some equipment. 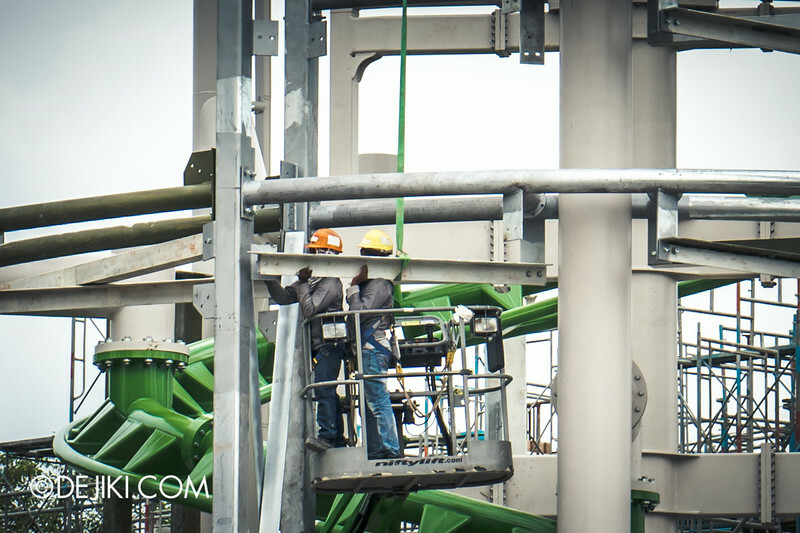 The test equipment on BSG Human is still there, attached to the track. Thanks to Luke for taking this photo! The entire track is now complete. 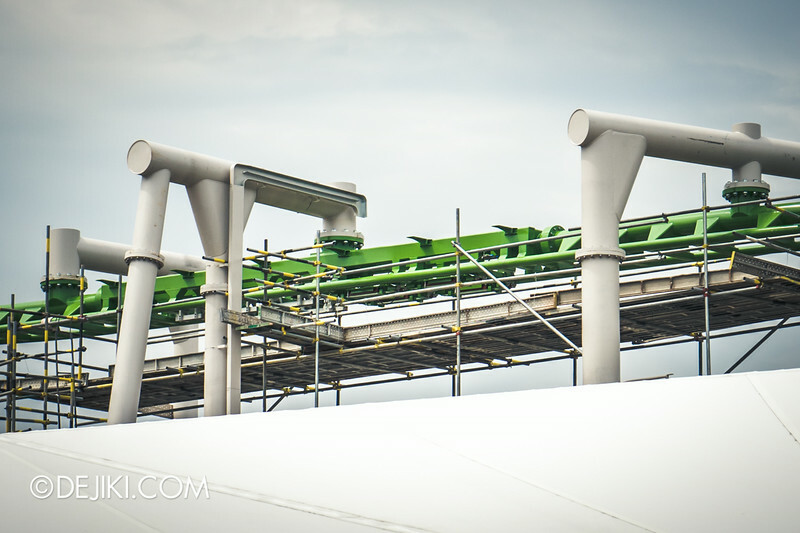 When viewed at some angles, we can see the dips and banking scattered around the ride. 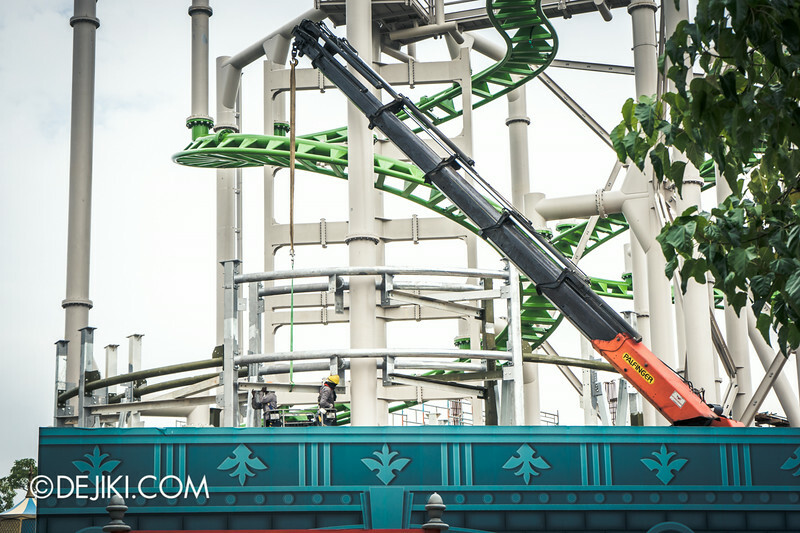 This attraction uses multiple block brakes – which is good news: It can have several ride vehicles moving around the track at any time. 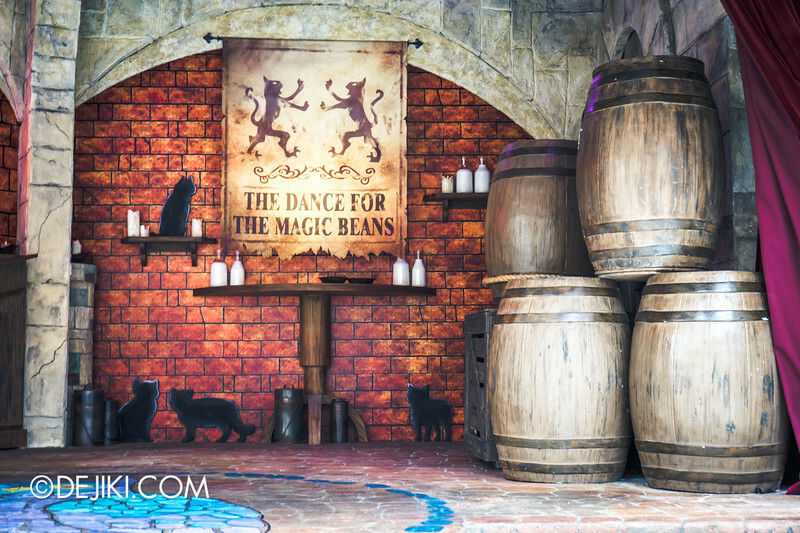 After a short soft opening, The Dance for the Magic Beans was officially launched on 6th September 2014. 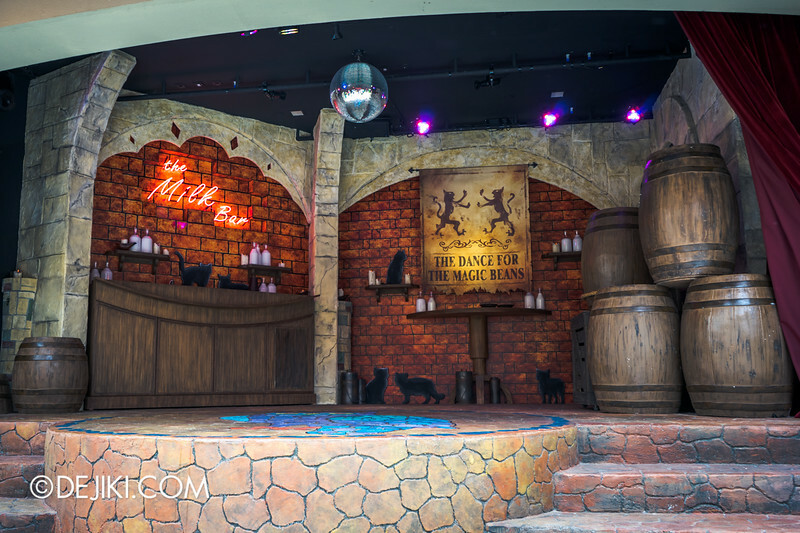 This mini stage show, at the new The Milk Bar in the park’s Far Far Away zone, features three characters: Puss in Boots, Kitty Softpaws and the Milk Bartender. 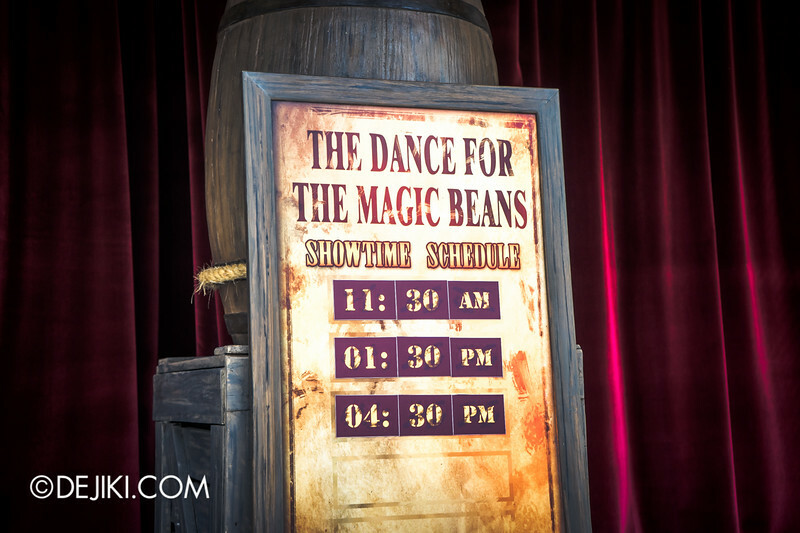 For some reason, the show is no longer called The Dance Off For The Magic Beans. The park carved out a stage by demolishing the old Versachery store display. The Milk Bartender, Alejandro, opens the bar in style. He presents the magic beans to the audience, persuading them to act impressed. Kitty Softpaws struts in, followed by Puss in Boots. And got a bit too hot. Alejandro declares a draw – both contenders receive a bean each. Happy Dance Time! The last segment features all three characters dancing to Lady Gaga’s Americano. 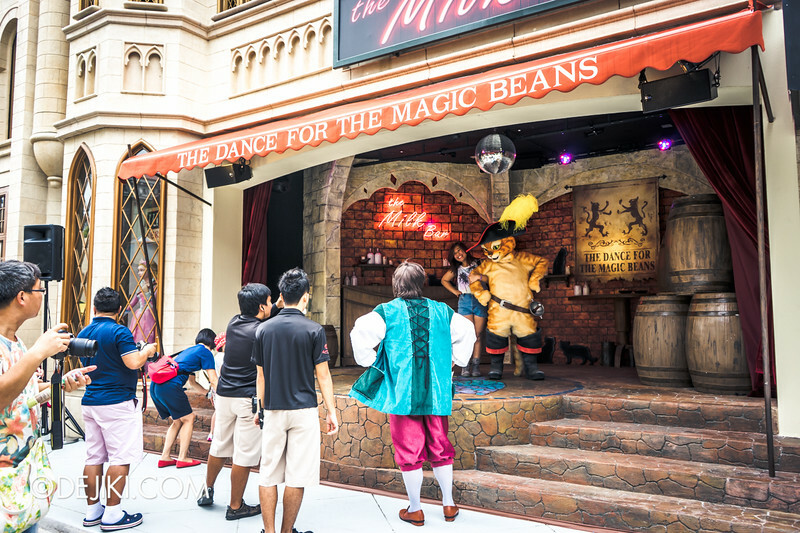 Here’s a full video of The Dance For The Magic Beans, the new show at USS Far Far Away zone. Mini Review: I found The Dance For The Magic Beans to be quite entertaining. The Milk Bartender did a good job getting the audience’s rapport. I must also commend the performers for being able to dance while wearing those character fur suits. Generally, the show wasn’t too long, or too short. It’s somewhat cheesy, but not as kiddy as Sesame Street. One thing I felt the park needs to do: Ensure that the audience – both kids and adults can get good viewing spots (perhaps those in front may have to sit on the ground). The Dance reused soundbites from the Puss in Boots film to voice Puss In Boots and Kitty Softpaws in USS. Yep – those spoken lines from the films – spliced together. It’s too expensive to get Antonio Banderas and Salma Hayek to record new lines. After the dance, the stage quickly became a Meet and Greet spot. The park crew also tried to lead guests into Donkey Live. Perhaps this small show could bring life to the quiet end of Far Far Away. 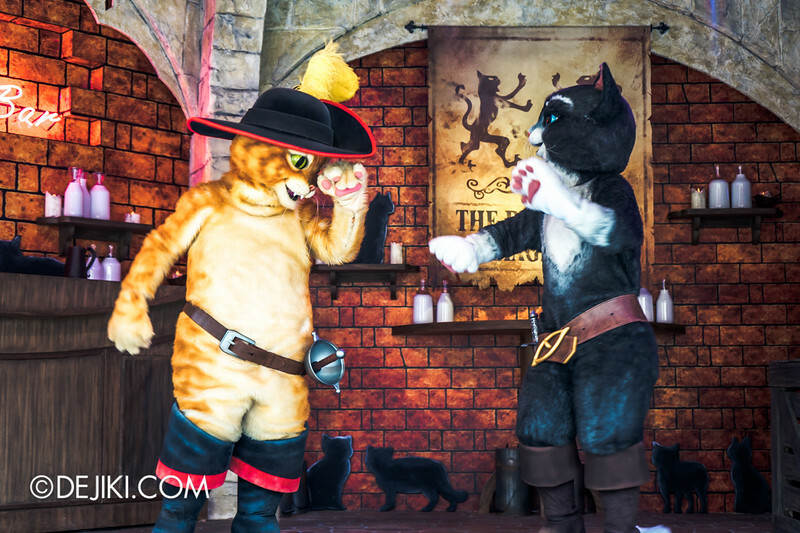 Stick around after the show (about 8 minutes long) for Meet and Greet with Puss in Boots and Kitty Softpaws! (And the Milk Bartender, if you’d like). The queue starts from the left of the stage, so you might want to stand closer to the left and be the first few in line. 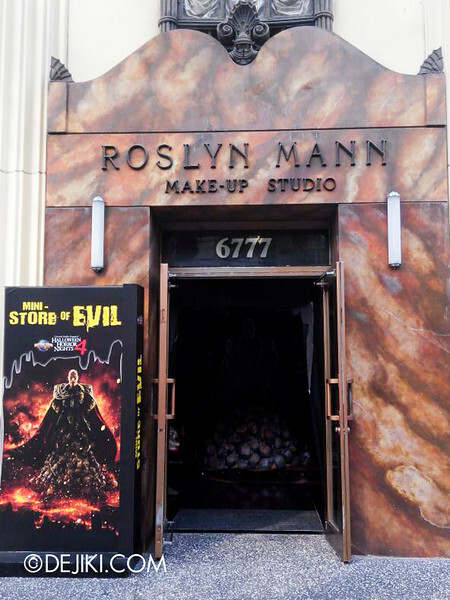 Fellow theme park enthusiast FF sent in these photos of the new Mini-Store of Evil. 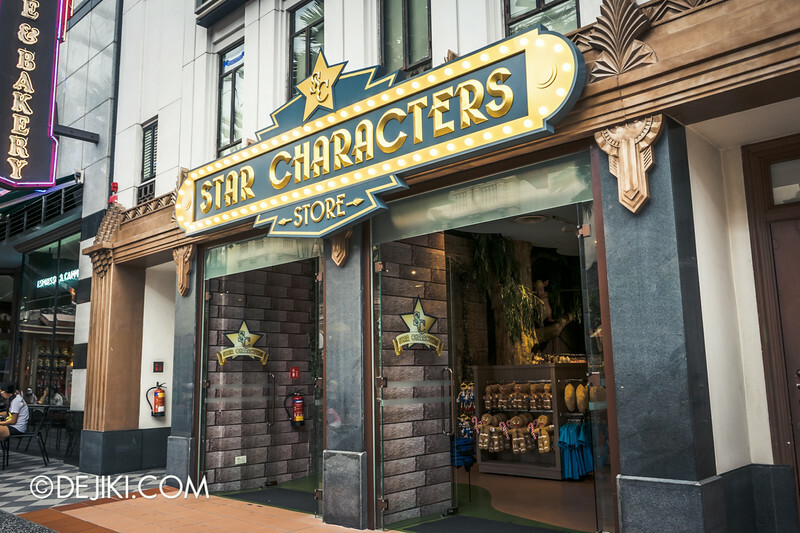 Hilarious name aside, this pop-up store is located at the Hollywood zone, in between the Universal Studios Store and Hollywood China Bistro. Shop till you drop dead at the only store worthy of the Minister’s endorsement! Lots of items, from creepy home decor to simple themed costumes.. The products on sale are similar to those at the Universal Studios Store for now. Of course, the shopping experience is more immersive here, with UV lighting and creepy items glowing in the dark. Would you bring some of these scary things home? Monster Rock had their curtain call on 31st August 2014. The final show was eventful, with a very enthusiastic turnout. I’m sure those who attended would say that the energy was just phenomenal – the crowd really rocked Pantages Hollywood Theater. I’ll have the photos up in separate tribute feature post. If you have any thoughts or messages you’d like to share about Monster Rock, do leave a comment so that I can compile them for that Tribute blogpost. 31st August marked not only the last show of Monster Rock, but the last performances for some of the park’s cast members as well. It was also a tearful goodbye for the Dinettes and some of the show’s fans. 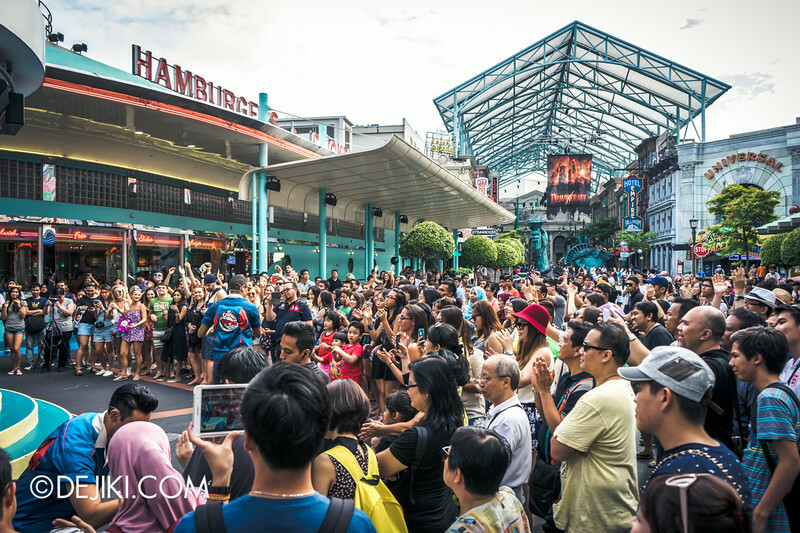 And this is some amazing crowd for the final The Cruisers performance for some cast members. Have you ever seen Hollywood so packed? The Marquee at Pantages Hollywood Theater was quickly updated with its new show. 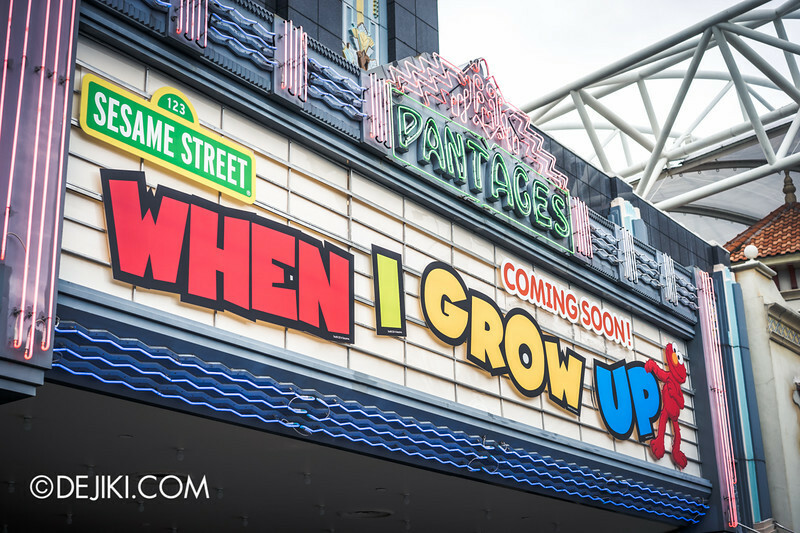 Sesame Street – WHEN I GROW UP will be performed at the theatre from 20 September 2014. 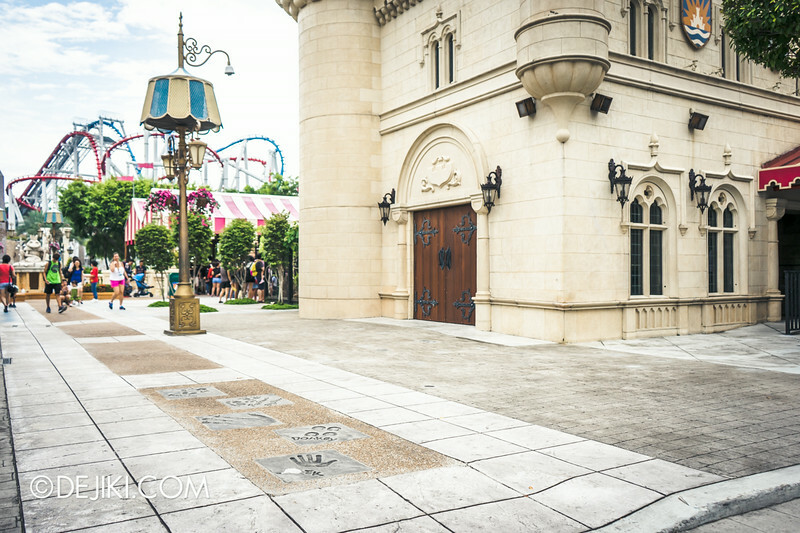 Two weeks ago, RWS revamped its Attraction Pass again. 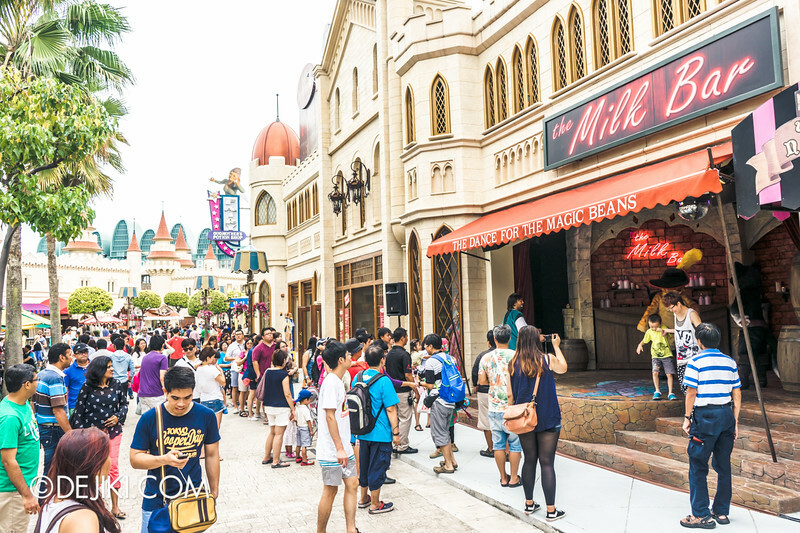 Now, USS Annual Passes have RWS Invites membership scheme built-in. 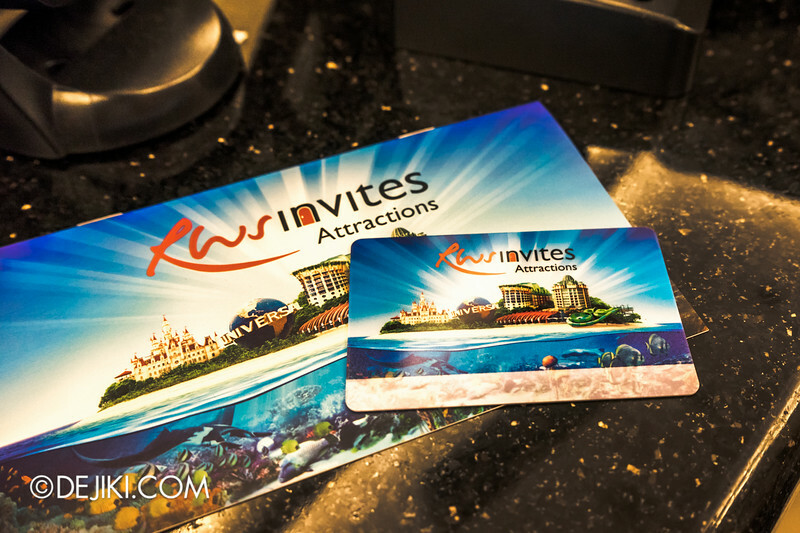 RWS Invites is mainly a Spend-for-Rebates card, with some other benefits. 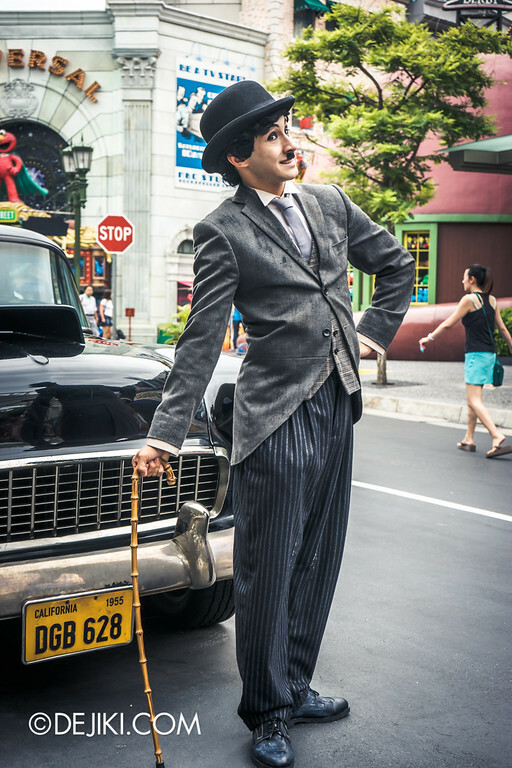 Current Annual Passholders can convert to the new RWS Invites Attractions Pass for free. If the passholders already have a separate RWS Invites card, or Annual Passes to other RWS attractions, everything can now be combined into one card. Pretty convenient. However, it seems that the Annual Pass Lobby is being swamped with conversion and upgrade requests. Don’t be surprised to wait in line for a while. This section of Far Far Away is oddly… empty. The queue switchbacks for Enchanted Airways have been removed. Mysteriously, the park had one of those Show Times guide with no date printed on them. 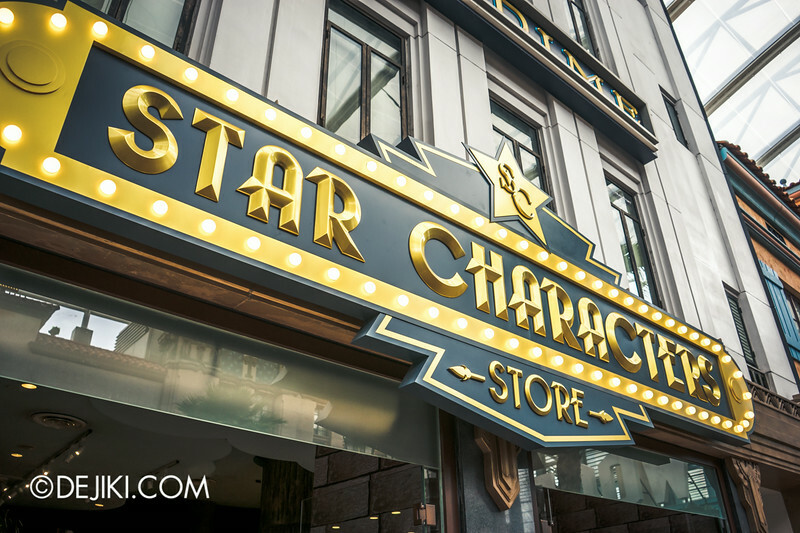 The Star Characters store now has a fancy marquee. 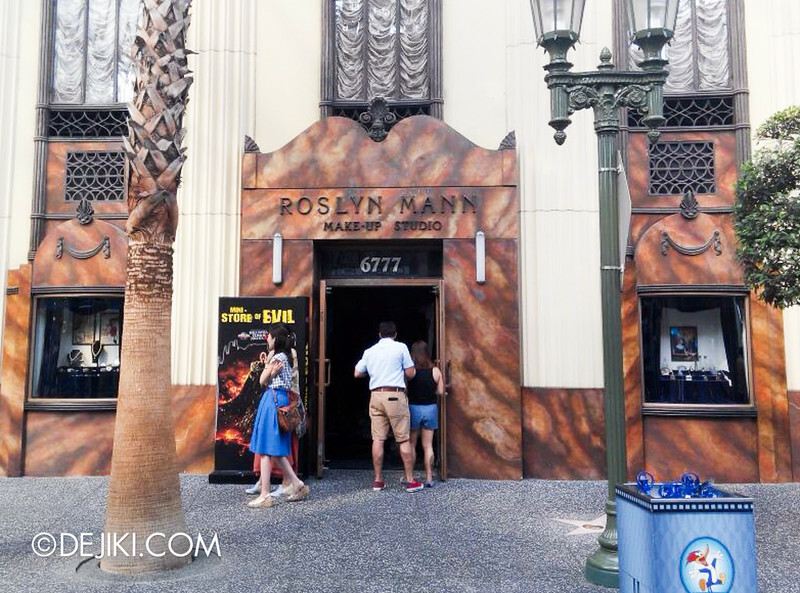 Looks great with the rest of the Hollywood building facades. 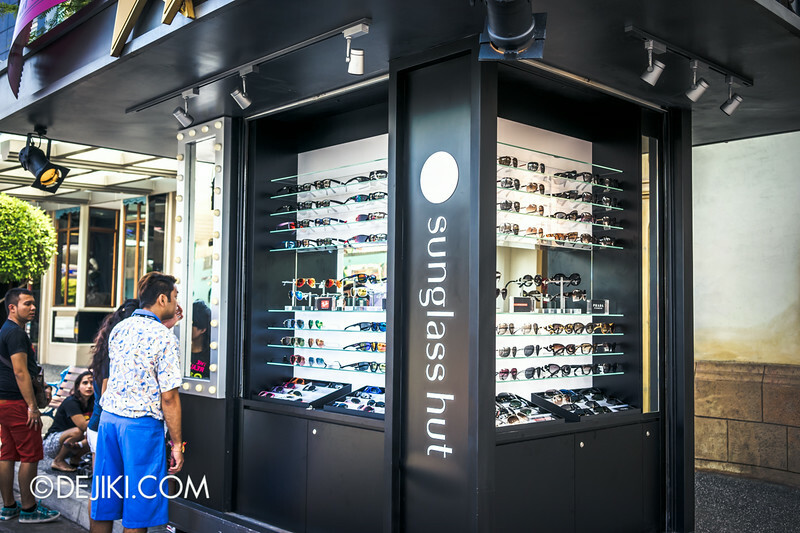 In all manners of strange: Sunglass Hut opened a branch in USS. 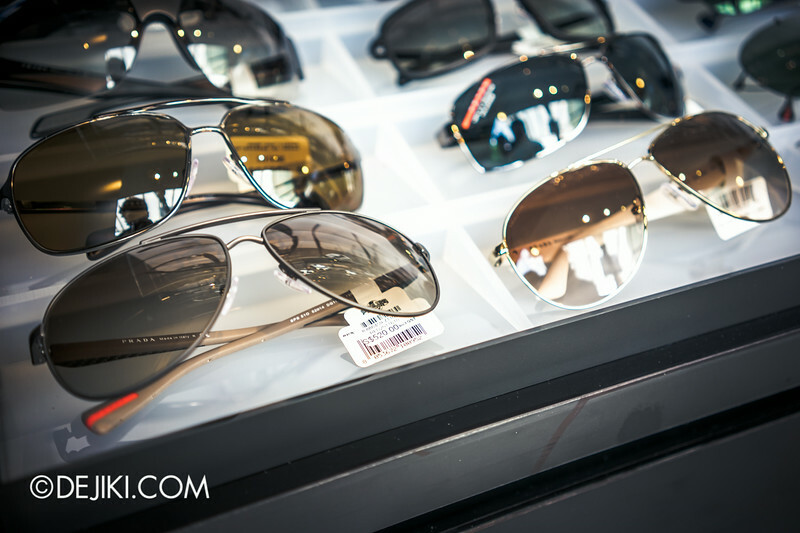 You can grab your PRADA shades here. Marilyn seated in front of the Universal Studios fountain to meet park guests. Is this a new form of Meet and Greet? 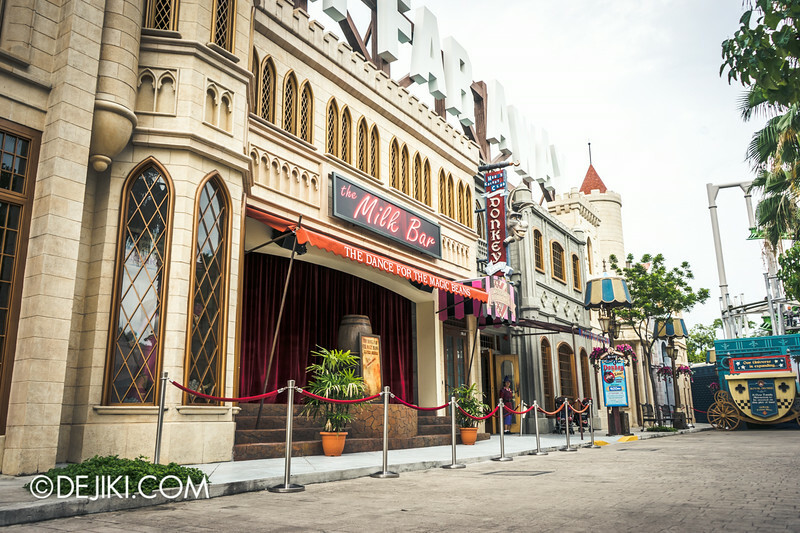 There’s no better place to see witness the park’s transformation for Halloween Horror Nights 4. Yes, DEJIKI’s Halloween Horror Nights – Before Dark is back. 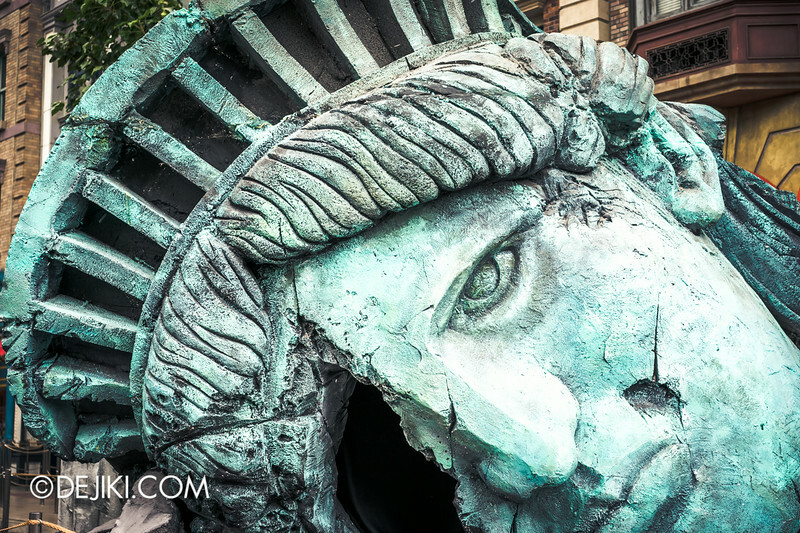 Read Part One here first, then move on to Part two for more day-time horrors. 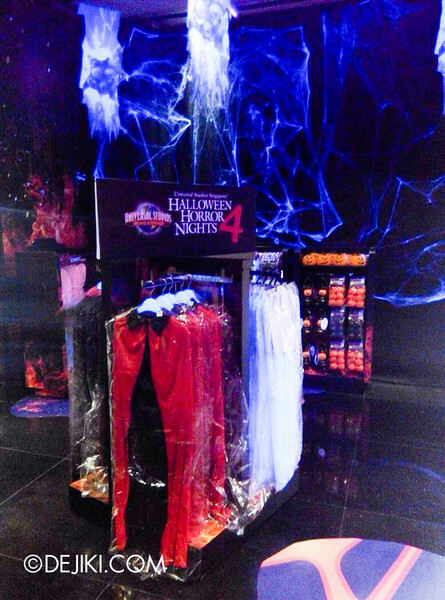 Next month’s park updates will undoubtedly focus on Universal Studios Singapore’s Halloween Horror Nights 4. 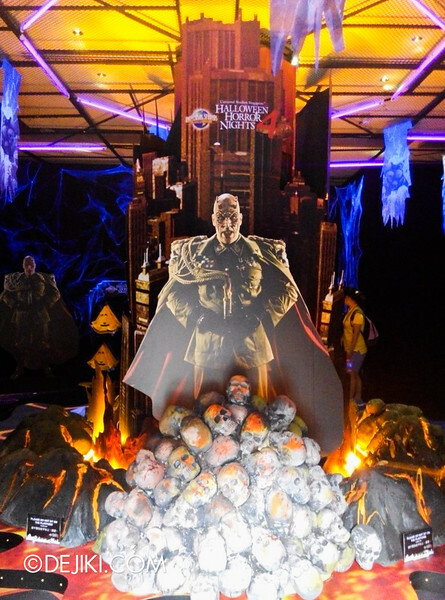 Buckle up for the region’s biggest fright fest! Well, regarding Monster Rock, I liked it because it featured a slightly different cast of characters as compared to other versions of the Universal Monsters Live shows. I like that they added She-Wolf and the Phantom of the Opera (who was actually a part of the original show at Universal Studios Hollywood). 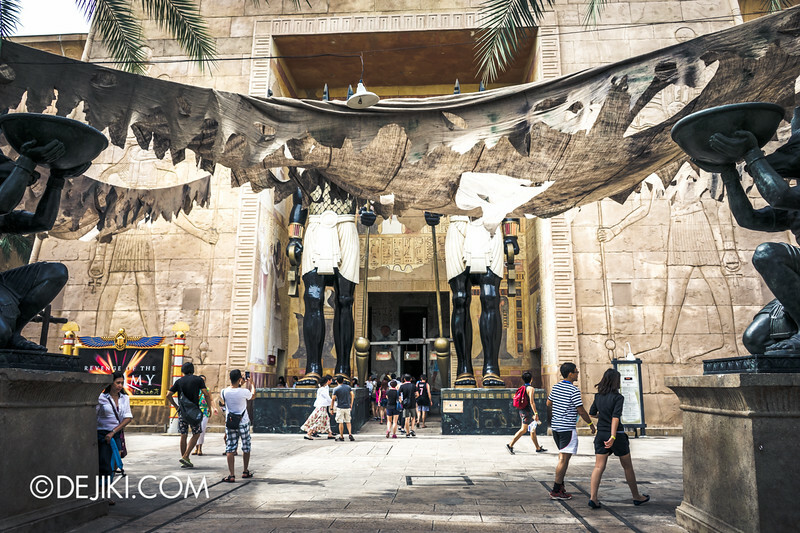 Universal Studios Florida’s show also has a Phantom and a Mummy now, if I’m not wrong, but they are Phantasia (sort of implied to be the Phantom of the Opera’s daughter) and Cleo(patra). I especially liked the audience interaction segment when the Monsters came down to mingle during the “Born This Way/ Walk This Way” number. Regarding The Dance For the Magic Beans, Kitty Softpaws looks awesome! I do have a question; are the Mel’s Dinettes really gone from the park, or is it just some of the cast members? Anything about the Daddy O’s or the Cruisers? The last few times I went to USS, the times guide printed something like The Daddy O’s/ The Cruisers, but I always saw the Cruisers. 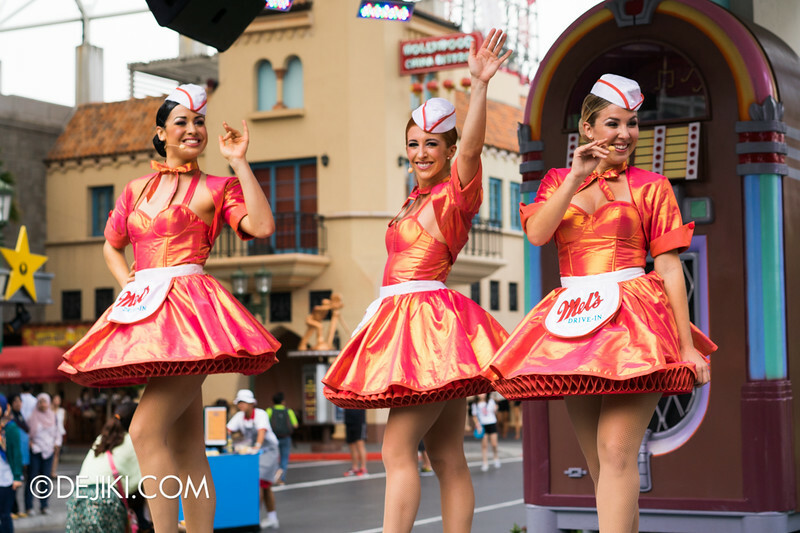 Also, who provided the dialogue for the Hollywood Dreams Parade? The Scorpion King’s monologue at certain points couldn’t have been Dwayne “The Rock” Johnson, right? Besides, it sounds a bit different. Thanks for sharing your thoughts on Monster Rock and The Dance for the Magic Beans! Mel’s Dinettes and The Cruisers form the current line-up for Street Entertainment at Mel’s Stage (with some new cast members joining from September). The Daddy O’s has not appeared on the park’s schedule recently. It may be quietly retired. Speaking of being quietly retired, you might have noticed that the female alien stilt walkers, the Egyptian stilt walkers, the Fairy Godmother, Prince Charming, Rick and Evie O’Connell, Ardeth Bay, and possibly more characters have all been unceremoniously removed from the park. Some of them were very popular with guests too! Strangely, generic characters like Cleopatra and the dinosaur puppet guy remain. Woulda been nice if they gave us some warning so we could have said goodbye! The Cleopatra character is, based on what I’ve been told over time, inspired by Anck Su Namun from the Mummy so she sorta is a movie character I guess. I went for all 6 sessions for the new stage show during this weekend. Kitty Softpaws and Puss In Boots might be exhausted from that exciting dance off! Yea! I guess that is what I thought! Well I guess I’ll just let that new stage show stabilize first! 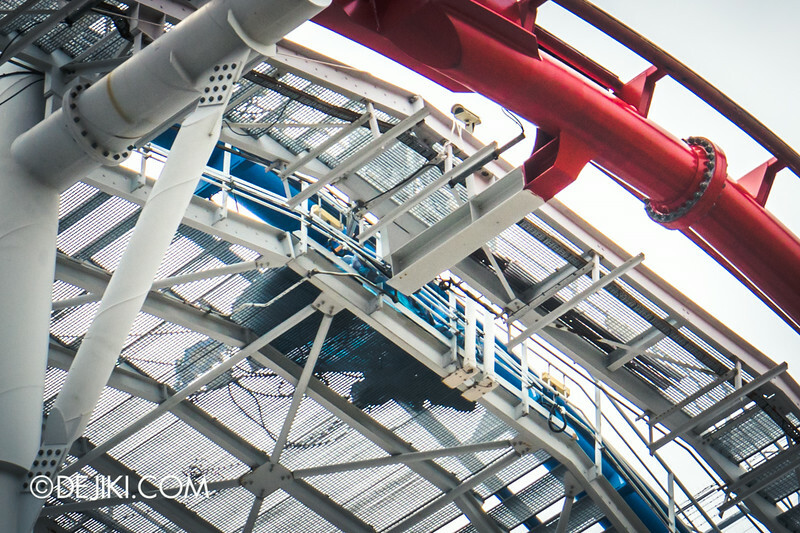 If BSG re-opening is confirmed, the park feels active again! – I will be standing down there watching the BSG riders screaming in fear while they are being tortured – Especially CYLON track where they will encounter 360 degrees turn heheheh! 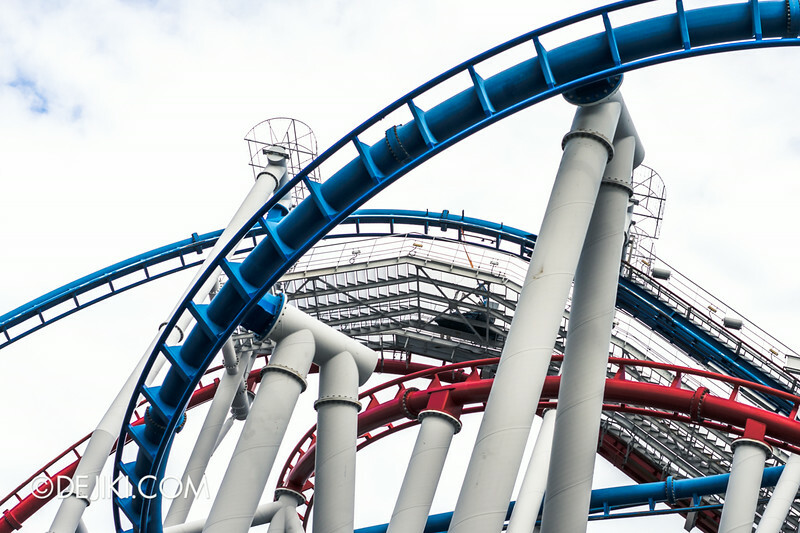 I have to admit this – No way I am going to ride BSG! I already have problems with Revenge of the Mummy haha! I believed he knows me quite well already! I like the idea of Marilyn sitting at meeting guests like that. I actually saw that in June, but subsequently she met standing as usual in Hollywood and New York, so maybe they were testing it out. I wonder if Betty Boop will get a similar treatment. I think it’d be good if they got some colored umbrellas to match their dresses like at the other Universal Parks. This would also help them deal with the humid weather. If you noticed, majority of the operating hours is 10 AM to 7 PM. Having attended same stage shows many days, many times, the showtimes schedule is always the same for that majority of that operating hours. 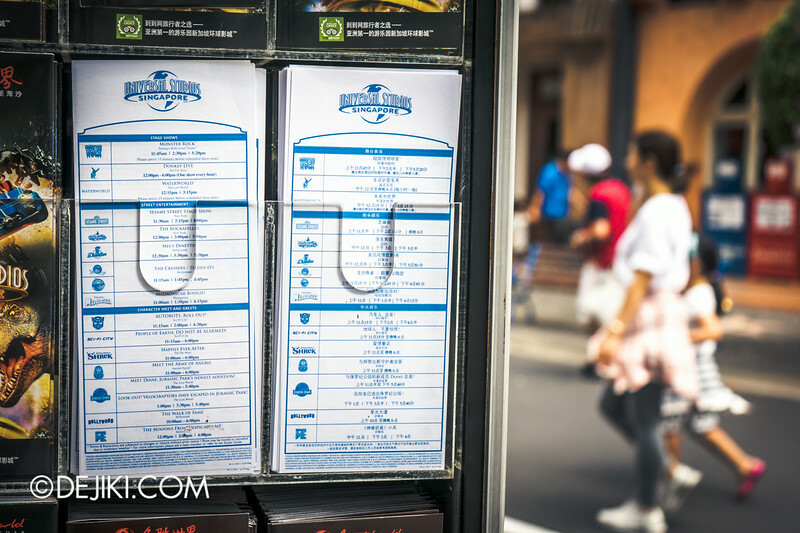 So I suspected they are re-using the showtimes guide for the operating hours of 10 AM to 7 PM. That is very likely. Thanks for bringing that up! Great update! 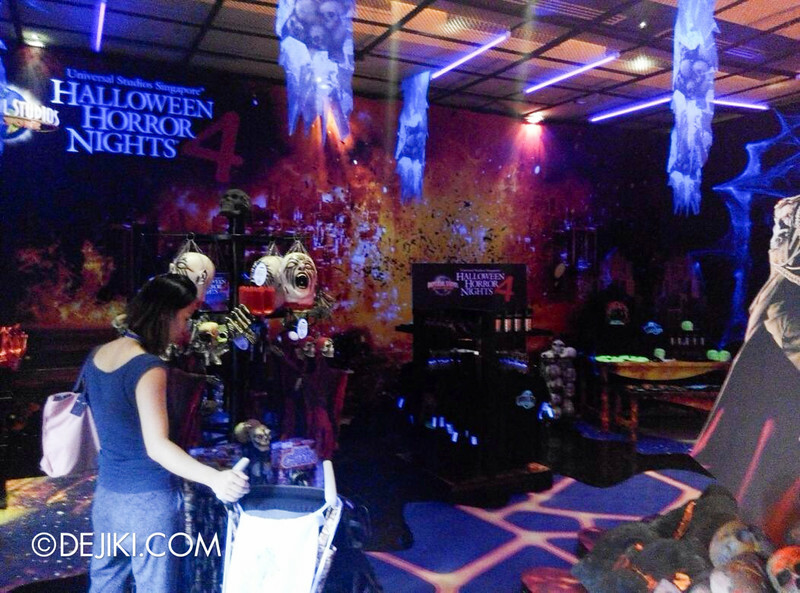 Have been checking out the Halloween Horror Night before dark and it really look awesome & exciting ! Can’t wait for the next update ! 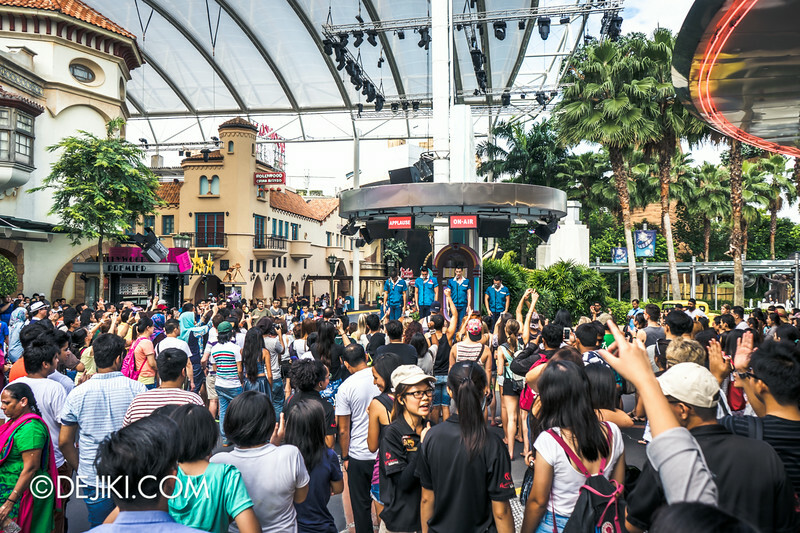 I have been catching their show ever since i step into USS. It was so good that i kept coming back to watch it again. It’s really sad to not see them often, i really got to get used to it. Their performance really do have a lot of fans screaming for them and sometimes i do too. Love their music mash up . Pantages Hollywood Theatre was my home attraction as a crew in USS and I was there even since USS was opened to the public. From 01 March 2010 to 31 August 2014, 4.5 years of tearful memories will stay with me for life. It is the place which gave me some of my lifelong friends. We would have watched more than a 1000 times of the show, seen many casts come and go, made friends with some and seen the attraction change. Goodbyes are never easy but such memories will be an important part of all our lives. Thank you the 7 Universal Classic Monsters! Thanks for this wonderful update. I am especially excited about the confirmation of BSG reopening. Not that I doubt your source, but I have been checking for other new sites which have reported this Genting announcement but to no avail! Can you point me to the source? Lianhe Zaobao first published the news from Genting Group. Hi, how does the express pass work? I will be bringing 8 primary school kids so can I just place the printed pass on a lanyard for each of them? 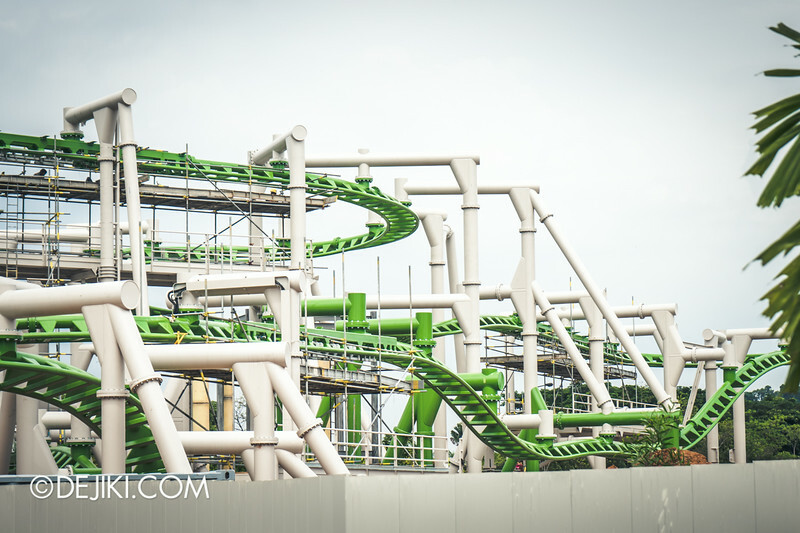 Will they be scanned before each ride? Express Pass is checked at the entrance of an attraction, and at the end of the attraction’s queue (before going on a ride or before seating at a show). Park crew will either scan or make a mark on the passes. Since you are going with 8 children, I would suggest safekeeping the passes for them. I just have a question on when will the next update for the USS or How often do you go to USS to check on the new rides, to be specific the BSG? Hehe. Hi Dejiki, the song for the Puss in Boots show by Lady Gaga is Americano, not Alejandro. Realized that recently. Also,I caught the parade today and there were definitely some changes. Good changes? I thought they were ok but the parade feels too short! Dracula and Bride have been replaced by Elmo and friends, and the Nile Princess is now on the float with Imhotep. I didn’t see Woody and Beetlejuice in the parade today. I wonder if that’s just a one-off thing, or if they are no longer in the parade.